Feel the charm of country properties in Spain with this one. This beautiful country property is located in a private, tranquil setting with breathtaking views. This attractive, well designed country property is accessed via a well maintained dirt track and it is only a 15 minutes drive from the traditional white village of Canillas De Aceituno where you will find all of the required amenities. One accesses the property via a gated car park. The main entrance to the house is through a pretty Andalusian patio area that takes you into the bright and sunny "garden room", perfect for the winter months. A further set of doors leads into the open-plan living-dining area with air conditioning and a large wood burning stove that will comfortably heat the whole house in the cooler months. A rustic brick archway takes you into the "American style" fully equipped kitchen and the utility room with plenty of storage shelves. Each double bedroom is accessed from the central living area. The master bedroom with an en-suite shower room features air con, a ceiling fan, fitted double wardrobes and French doors which open on to the garden room. One of the double bedrooms is currently being used as a twin bedroom with Air con. Then, there is another double bedroom with air con, a ceiling fan and built-in storage which has been cleverly converted into bunk beds, perfect for young children. There is also a family shower room with French doors that lead outside to the terrace/swimming pool area. The exterior of the property comprises storage for firewood and garden equipment. In addition there is a handy storage shed and a small workshop/pool room. Then there is a steel framed pergola with a retractable canopy which provides the necessary shade for outside dining. From here one can relax and enjoy the delightful Mediterranean gardens with glorious views of Mount Maroma. This property is perfect for all year round living and equally it is ideal for the holiday rental market. 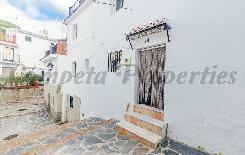 It is already registered with the Andalusian tourist board and has an excellent rental history.